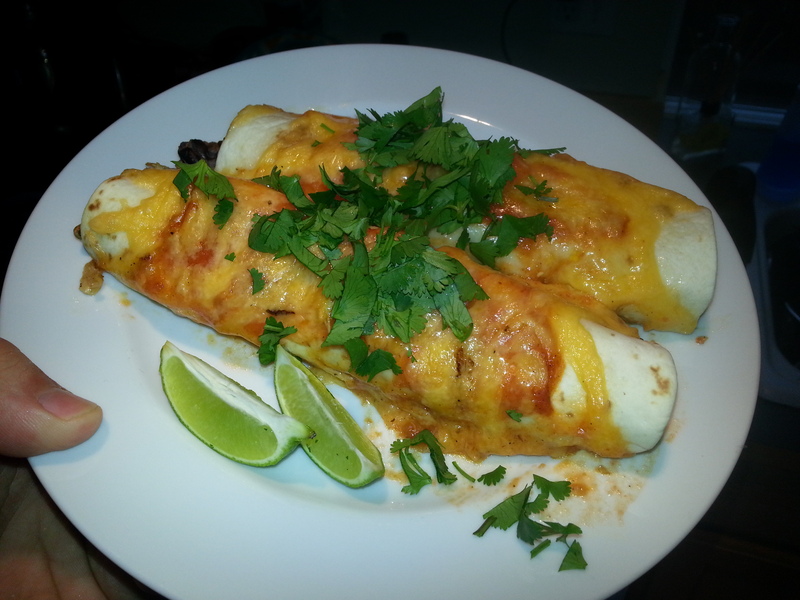 My last post was the recipe for my awesome enchilada sauce, so it only makes sense to post about the awesome chicken enchiladas that I made with it. Preheat oven to 350 degrees. Coat a 9×13 baking dish with cooking spray. In small saute pan on the side, heat 2 tbsp of oil over medium heat. Add diced onion, green chiles and mushrooms. Saute until onions are cooked and translucent. Turn off heat and add chicken to mixture. To assemble the enchiladas: Lay out a tortilla, and spread a spoonful of sauce in a line down the center, and add beans on top of the sauce. Top with some chicken mixture, and cheese. Roll up tortilla and place seam-side down in baking dish. Once all enchiladas are made, pour extra sauce over the top. Bake at 350 degrees for 20 minutes. Then remove dish and sprinkle extra cheese on top, and bake for 5-10 minutes more until tortillas begin to brown slightly around the edges. Remove from oven and serve immediately.